Sometimes a tune hits your ears and triggers something in you that cannot be described. Maybe it's the singer's voice, maybe it's the melody of a chorus, maybe it's the combination of chords and notes; something about music can reach a listener that makes them absolutely connected to the artist. Several years ago I was connected to a tune entitled "The Pills Stopped Working" by the band Hem. And for me it was everything: the voice, the melody, the notes. This was a band whose music and voice were completely seamless, a group of musicians that, without a doubt, belonged together. Hem is an indie folk-rock band from New York City whose core members include Sally Ellyson (vocals), Dan Messé (piano, accordion, glockenspiel), Gary Maurer (guitar, mandolin), and Steve Curtis (guitar, mandolin, banjo, back-up vocals). The extended members include George Rush (bass guitar), Mark Brotter (drums), Bob Hoffnar (pedal steel guitar), and Heather Zimmerman (violin). The distinct voice comes from the magical vocal cords of Sally Ellyson. There's no mistaking her voice. Her range alone is amazing, and what she contributes to a song is pure magic. A simple line becomes extraordinary through her heartfelt voice. And, fortunately, Ellyson is backed up by one of the most flawless bands. Together they create music both humble and elegant. 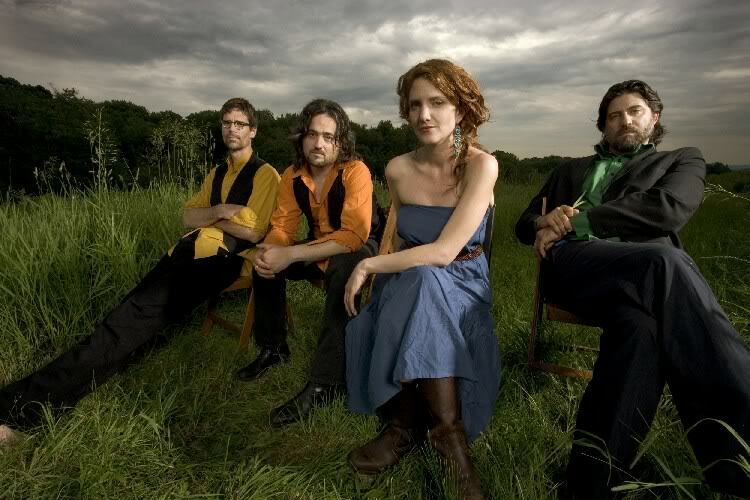 Categorized as a folk-rock band, Hem eases into progressive country music. They're able to perform country standards and make them their own, as well as produce original tunes that would dumbfound any country super star. They also have an incredible ear for choosing music to cover. Listening to their version of "South Central Rain" (originally written by REM) is something to awe. Ellyson's voice accompanied by the band is heartbreakingly beautiful; they bring an authenticity to this track that makes you wonder if they were the actual authors. This natural authenticity is evident in all of their music, helping make them universal enough to play in any relaxed setting but innovative enough to study. To date, they've released four studio albums, three EPs, and several compilations including Twelfth Night, an album written for a stage production during the annual Shakespeare in the Park (in New York's Central Park). Because of their consistently strong releases, there really is no one album that should be a starting point for new fans. Pick any of their albums at random and you'll be amazed. Teaming voice and band so perfectly can be a near impossible task. Many settle on what they can get. How Hem was able to work so well so easily is perhaps a mystery, or fate. And to think the band found Ellyson simply by placing an ad in The Village Voice (a free weekly newspaper based in NYC). Months later, after the core band had given up hope, Ellyson called in response to the ad. And in a humbling note, warned the band that she was not really a singer. Whatever the reasons for the ease of their formation, the stars were aligned and as a devoted fan, I couldn't be luckier. Hem is truly a thing of wonder. Below is a list of suggested tracks from their studio albums. Keep in mind that their entire collection is worth listening to but this is a starting point for newer fans. 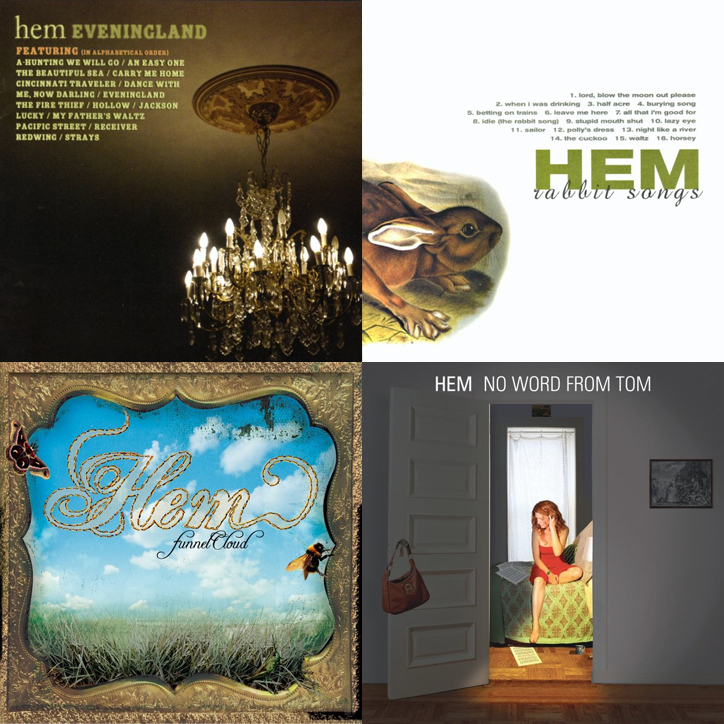 Suggested tracks from the album "Rabbit Songs"
Suggested tracks from the album "No Word From Tom"
Suggested tracks from the album "Eveningland"
Suggested tracks from the album "Funnel Cloud"
For more information on Hem, visit their official website: www.hemband.com. TRIVIA: In 2006, Hem received a career boost when the song "Half-Acre" was featured in a television commercial for Liberty Mutual insurance.